Mercedes-Benz's AMG division recently took the controversial step of installing all-wheel drive on some of its wild cars like the E63 AMG, which put BMW's M in a predicament over what to do with some of its powerful cars. Unsurprisingly, the X5M and X6M performance SUVs have sent their power to all four wheels, but BMW hasn't added an xDrive system to any of its power-rich M cars. Yet, anyway. 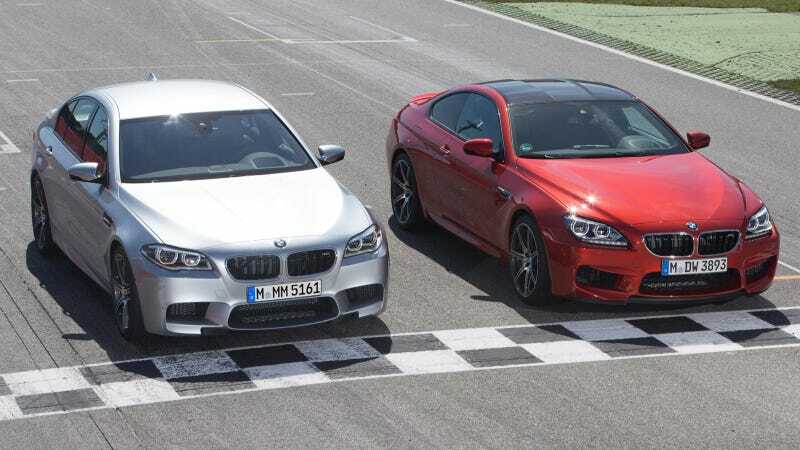 According to Motoring, big M cars like the next-gen M5 and M6 could be equipped with some kind of all-wheel drive system to rival the four-wheel-driven AMGs, Audi RS cars and hot Panameras. M head Friedrich Nitschke says it's a possibility as on option on those M cars so that these powerful cars can keep up with the competition. But Nitschke says it won't be standard "because a lot of M drivers prefer rear-wheel drive." That's probably comforting news, since AMG transformed the tire-smoking E63 into something Travis called "almost docile" when he drove the 4Matic version alongside a bunch of performance cars. Aside from adding weight, some kind of xDrive will definitely transform these torque-rich Ms. It's probably comforting, then, to M purists that Nitschke says the new M3 and M4, which are coming soon, will definitely not get an all-wheel drive system. In fact, he said "Never." I mean, they're already turbocharging all of them. The M president knows there's only so much change people can take.